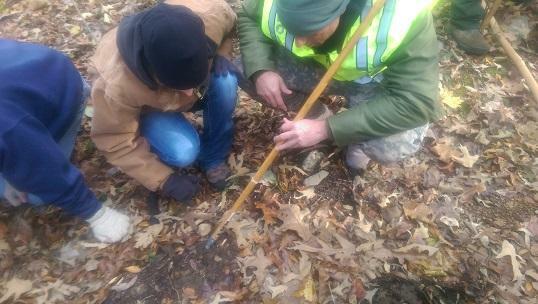 Mantracking students take their first stab at identifying human tracks during a class exercise. SMYRNA, Tenn. (WMOT) -- It's a common scene in detective movies and westerns - the bounty hunter kneels down and carefully examines the ground, then looks up and says something like, "They were here, moving fast, toward town." It's not all Hollywood make-believe. Mantracking is the art of following another person through wild terrain by correctly interpreting clues left by their passing. Mid-state master tracker and forensic anthropologist Hugh Berryman says tracking is the first investigative tool man ever used. But attend a mantracking class and you quickly discover that modern life can make learning the skill challenging. 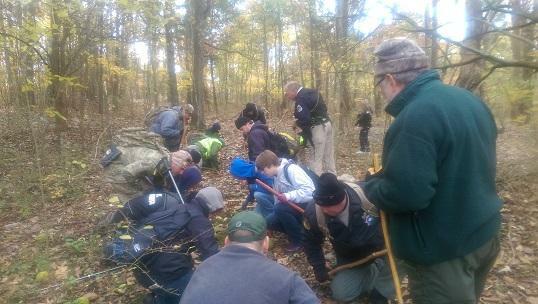 During one such recent class, held in Middle Tennessee and sponsored by the Forensic Institute for Education and Research and Education, instruction began with the 20 or so mantracking students being marched into the woods for their first field exercise. Most immediately looked a little lost. Instructors lined them up in two rows an arms length apart and the instructor walked between them. The students watched closely as his boots hit the ground in front of them. But when asked to point out some sign of his passing, they struggled to see any evidence of it among the leaves, twigs and weeds at their feet. Would you like to hear this story? Nashville based Master Tracker Levi Montgomery has been teaching these classes for years. He says initial frustration is typical. Most novices expect to see actual footprints, but Montgomery says that’s rare. He says wild land tracking is about noticing and interpreting the tiniest of clues; a broken twig, a disturbed pebble, or maybe an overturned leaf. He says it requires practice and patience. “Slowing my brain down enough and relax from inner city living and get out into the country and actually start determining the disturbance in the ground. What’s the real natural lay of the ground and what’s been disturbed; what’s been brought in and changed?” he asked. A couple of hours into the class things were going better, perhaps because the students had been divided into four person tracking teams. The team leader focused on the small clues left by each step. Flankers roamed to either side to ensure the direction of travel hadn’t changed. The rear observer looked down the trail for more obvious signs of passage. Student Jamison Peevyhouse sees real potential in the technique. Peevyhouse is Emergency Management Director for Weakly County in West Tennessee. Peevyhouse says he won’t have to rely on luck once he’s formed a small tracking team; a team that can hit the ground running. “They’ll be on the scene first. And while everybody else is trying to glean information from parents and bystanders these six person or eight person teams will be out there searching the area trying to find where the track is actually at,” he said. Dr. Hugh Berryman was host for the class. He is director of the Forensic Institute for Research and Education at Middle Tennessee State University. Dr. Berryman says tracking is usually referred to as an art, but he believes it will someday be a science. While the science of tracking is yet to be developed, Dr. Berryman says tracking students can expect a more immediate change in the way they see the world. He quotes a famous tracker.